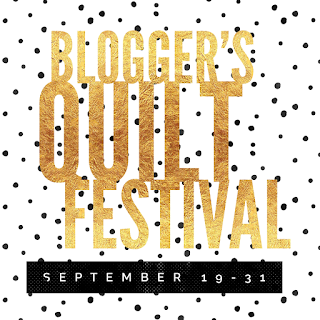 Every year, I look at Amy's "Blogger's Quilt Festival" on Amy's Creative Side and swear "next year I'm going to enter!" Guess what? It's next year! And I have a fun quilt to enter in the Modern Quilts category. This is "Crow in the Wheatfield." The spectacularly bright yellow is Kona's "Color of the Year," "Highlight." Remember the very first yellow highlighter pens? It's that yellow! I'm so lucky to have a great boss at Ruth's Stitchery, who is willing to buy a fabric for the shop just because the staff likes it! The 'crow' is Hoffman's black batik -- with just the slighted bits of navy blue, just like a crow's wing. 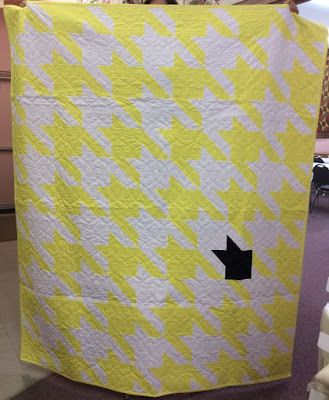 The pattern is adapted from Tula Pink's Houndstooth Check pattern. It's quilted in my favorite "Modern Figure Eight" design. Here is a link to the main Blogger's Quilt Festival page. And click here to see all the modern quilts in the Festival.